It's rush at work. All of the colleges across the land are heading into second semester and need books. So they call us. We usually bring in a few temps during this time to help with the increased work load. For one reason or another we had problems this time. Finally we got our 5th choice to take the job. She comes in and starts training. Turns out she's dumber than a Box of Rocks. Boss Man calls me into his office and tells me her thinks Box of Rocks (BoR) is intimidated by her trainer and wants her to sit with me. I eyeball him a moment and then tell him I don't think that's a good idea. I'm not that unintimidating myself, plus I have a low threshold for fools. Boss Man tells me to just do it. So after awhile we are talking (I've basically given up training at this point and am just letting her sit at my desk) and she tells me about the classes she is taking out at the local community college. She commented on how overwhelmed she was by the class teaching Windows 2000. My jaw almost hit the desk. Overwhelmed? By Wind owes 2000? Our system is an old clunky A/S 400 based dinosaur. You need to be quick and nimble fingered to do well. Now I am not heartless. Maybe she needs the money. So I go into Boss Man's office and let him know that she will never ever be able to get on the phone. Maybe she can do something repetitive, like paper orders. No checking stock, no looking up back orders, nice and easy. We also decide she can fax invoices to people, that also very easy. When I saw what she had done yesterday (or not done as the case may be) I went to Boss Man and told him he needed to get rid of her. Her salary comes out of the department budget, which, in the end, works out to whether we get raises at the end of the year. We don't mind this if she was actually contributing enough to pay her salary, but she's not. Boss Man was a little skeptical about bringing some else in at this late date. I told him to just leave the position empty, we are covering everything anyways. Boss Man said he'll think about it. We'll see what tomorrow brings. On the same note, I told hubby all of this and what I have been saying to Boss Man. 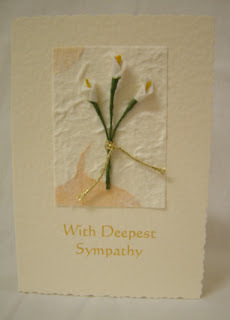 Hubby is starting to think he needs to send a sympathy card to Boss Man for having to deal with me. Ooooh, boy. That's a tuffie. Sounds like the gal was probably Special Ed when she was in skool, so I've got sympathy for her, but in the Real World you gotta be able to do more than 12 orders in 8 hours. I mean, I'm alllll for ADA, and I applaud your effort to A) help her out and B) find something easy and repeatitive for her to do but I also understand work must get done. I am surrounded by fools so I feel your pain Raven. Have a good weekend. Knowing very very much what you are going through, I believe that the sympathy card should go to you and the others in CS. Orange: She may have been in special Ed. But that's about all. I surprised she can drive, operating a car would be beyond the abilities I saw out of her. Matt: Thanks for the sympathy...I hope your don't make you too nuts. Duffie: You are the only one that really knows what it's like, and everyone is going insane. Plus, yesterday we were down two people. Nothing got done besides answering the phones. On the plus side yesterday was the BoR last day. So maybe during the last two weeks of rush we can get some work done and not just play catch-up on what we trhought she was doing. Understanding your insanity and also needing time out and away... would you like to meet up this week?